The Volvo 122S is one of those underdog classics that won't get you first prize at the next Concours d' Eggplant or even a Friday night domestic car show (gotta be a Chevy or Ford...sorry) but, pound for pound, it will get you more smiles per mile than most. 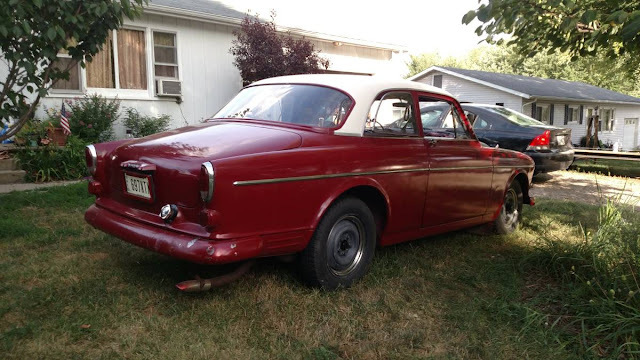 Find this 1964 Volvo 122S Amazon offered for $3,700 in Mechanicsburg, OH via craigslist. Tip from Hunter. 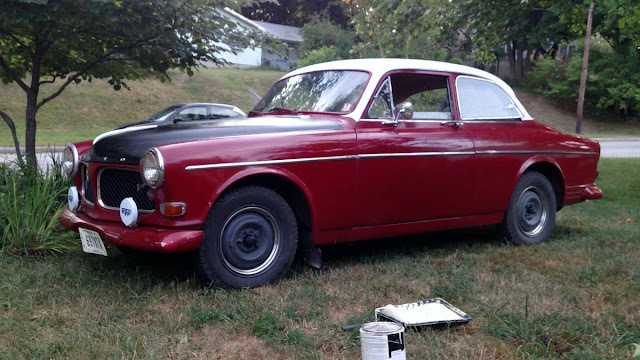 The Volvo Amazon (called the 120 series outside of Sweden) was the more practical older brother to the P1800/1800/1800S/1800ES sports coupe with which it shares all kinds of oily parts. The pre-brick Volvo sedans are starting to see some price appreciation because they offer a great combination of durability and usability in a vintage package. Today's example isn't a showroom fresh version, but it offers a rally looking exterior that is ready for whatever dirt/tarmac you can throw at it. Hi DT. I think there is a problem with that link. It does not resolve, and does not look like it was pointing to CL. Anyone else see that killer hood bulge in the first pic? Anyone else wonder what the roller pan of white paint in the foreground is for? I hope the roof didn't get a touch up with that. Hey, I have painted an entire car with a roller. Nicer finish than you get with a brush. To be classy, I used a brush to cut in around the glass and the trim! This was in the mid 80s, and it was a 1975 Dodge Colt that a buddy needed to do pizza delivery, at night. The worst part of the job was that we did it in an unheated garage in Ottawa Canada, in late December. Took the paint a while to cure. Fixed the link - thanks to Bob and Scott!